The Anonymous movement has gathered every November 5 since 2012, to coincide with the annual British tradition of Bonfire Night, which began when a group of dissident Catholic plotters tried to blow up the British parliament in 1605. 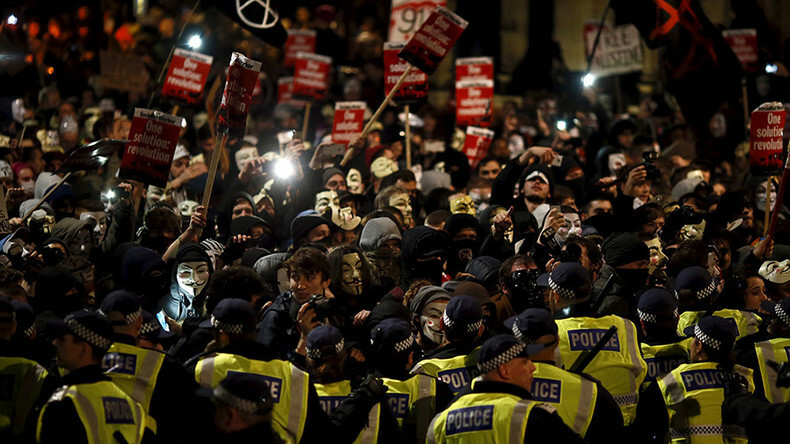 Activists wear Guy Fawkes masks popularized by the movie ‘V for Vendetta’ to protest corruption, censorship, inequality and war. RT brings you live coverage of the 750-city global event against billionaire bankers and injustice. Watch RT’s footage of the protest in London. Two men were arrested in connection with vandalism at Trump International Hotel and the Federal Bureau of Investigation that occurred during the Million Mask March in Washington DC, after several buildings and public sidewalks in the area were vandalized with spray paint, Metropolitan Police said. According to Scotland Yard, 53 marchers were arrested in London – three for the possession of a weapon, 14 for having drugs, and two for not removing their mask upon police request. Police have arrested six people at the Million Mask March in Portland for “disorderly conduct and trespassing,” KATU news reported. — Catherine Van (@cat08van) 6 ноября 2016 г. Two of the activists reportedly denied allegations that they had broken the law. In Boston, activists turned up in Guy Fawkes masks for a marijuana legalization sit-in. Protestors in Fort Worth, Texas, had high praise for WikiLeaks and strong words for Hillary Clinton. — Anonymous (@AnonymousNTX) 5 ноября 2016 г. “Hillary for prison!” read one of the banners. Activists rallied for recognition of Palestine and the legalization of marijuana in Los Angeles. In Chicago, activists carried Anonymous banners together with Palestinian flags. “From Standing Rock to Palestine,” read one of the placards.